I realized I was committing a slow, sad, drawn-out suicide, so in the second week of January of this year I quit. Cold turkey. Easiest thing I’ve ever done. Then three months later I quit my job at the cube farm and got to living. 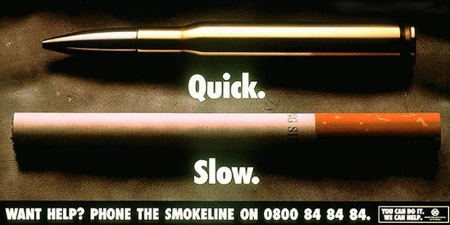 Whoever said quitters never win, never faced Big Tobacco. Its good to see you have to decided to kick it. Just curious, how has it been since you kicked the cubicle farm job? My guess is amazing haha. It really was easy to quit. It’s been 3 months and outside of a few cravings it’s been easy going. Once I realized it wasn’t making me happy and I didn’t need to do anything to quit (e.g. I could lay on my couch all day and night, but if I didn’t smoke I was doing damn well) it was pretty much a done deal. Big, big thanks to my friends too who didn’t give me a smoke the one time I had too much to drink and decided I needed one. I quit my job for about the same reason, 40 hours was too big of a time commitment to something that wasn’t making me happy. It wasn’t necessarily making me sad either, but it wasn’t making me happy. The forty extra hours I get a week now is awesome. It’s liberating. I have a significant savings account though to fall back on so it helps ease any worries and concerns. Thing is I like working, just don’t think a cubicle farm is the place for me (or any humans really). Highly, highly recommend it!